The fashionable colonial homeowner warmed each room and its brightened floors with rich, colorful, and durable floorcloths. Three modern makers continue the tradition so you can recreate the period look. The Comte got cold feet, so he yanked a canvas tapestry from the wall of his castle and tossed it on the chilly stone floor. Voila! The floorcloth was born. Legend locates the origin of the floorcloth�a durable floor covering made from heavily oiled and decorated canvas�in 15th-Century France, but such histories are little more than speculation. All we know for sure is that sometime during the Renaissance, probably in France or England, people began covering portions of their stone or plank floors with cloth sturdy enough to withstand the tread of shoes and boots. Some time later, people began embellishing the utilitarian cloths with colorful patterns. We also know that by the 18th Century, floorcloths routinely covered floors in both Europe and the American colonies because artists depicted them in numerous woodcuts and paintings of the period. Known then alternately as canvas carpets, rolled canvases, crumb cloths, or wax cloths, the name most frequently associated with floorcloths in England was "oylcloths" because of the heavy linseed oil and oil-based paints that added strength and weight to the fabric. A floorcloth maker started with a piece of heavy fabric, usually a seamless canvas such as sailcloth�linen in the 18th Century, cotton now�then he "sized" the cloth, sealing it with an aqueous glue to protect the cotton from the destructive effects of oil. As with an artist�s canvas, the floorcloth maker would then prime the cloth and lay several coats of oil-based paint over the primer, the last usually with a colorful design. Overpainting with varnish protected the design and added depth to the colors. The multiple layers of paint and varnish (or polyurethane on contemporary versions) gave the floorcloth its durability and about the same heft as heavy leather. The floorcloth�whether in 1700 or now�appeals on two levels, utilitarian and aesthetic. A durable floorcloth can effectively cover a floor of tamped dirt or stone or wooden floorboards. And it can be a work of art. Stenciled with a bright, geometric pattern or painted freehand with colorful images from nature, a floorcloth can have striking visual appeal. Newly made floorcloths in historic designs and patterns can help create a vintage ambience. Today interior designers are reviving the floorcloth as an alternative to the area rug. Dozens of skilled artists professionally market them, and artistic homeowners are trying their hands at creating their own. "There�s a revival occurring because awareness about floorcloths has increased, the number of artisans making them has increased and is creating more choice, and floorcloths are just an inherently great product," said Kenneth Forcier of Gracewood Design in San Francisco. Historic floorcloths are rare, literally worn to pieces. As with a handful of other museums, Colonial Williamsburg has several fragments of painted floorcloths in its collection but no surviving whole ones due to the amount of wear and tear inflicted on them. "Inventories of middling to upper-class Williamsburg households in the last quarter of the 18th Century indicate that floorcloths were fairly common," explained Kim Ivey, assistant curator of textiles at Colonial Williamsburg. "Painted floorcloths made of canvas were used in almost any room of the house. Because they were quick and easy to produce, floorcloths were inexpensive, which meant many households could afford them." Ivey noted that floorcloths were both imported from England and created locally. She has documents that show Robert Beverly of Blandfield, Virginia, ordered floorcloths from England on two separate occasions, one of which was to be a "good Thick Floor Cloth diced with white Divisions on one side, and red on the other side." In 1769, Williamsburg upholsterer Joseph Kidd advertised that he "fits carpets to any room with the greatest exactness and paints floor cloths." For much of the 18th Century, the American colonies depended on England for many of the finer fabrics and household goods including floorcloths produced by England�s cottage industry. By the end of the Revolution, manufacturing preference turned to home-based goods, and the burgeoning American canvas industry spurred the production of floorcloths. In 1816 a tariff imposed a 30 percent duty on imported floorcloths, discouraging imports and giving the domestic floorcloth business a further boost. The golden age of the American floorcloth covered the late 1700s to the mid-1860s, when Sir Frederick Walton invented cheaper, mass-produced alternative, linoleum. The thick, rubbery skin on a can of paint in his basement inspired Walton, an English rubber manufacturer. He decided to mix paint with ground cork and spread it on canvas, receiving an English patent in 1863. He named it for its combined ingredients of flax (linum) and linseed oil (oleum). Linoleum could be manufactured at a fraction of the cost and in vastly greater quantities than labor-intensive floorcloths�from which linoleum copied its earliest colors and patterns. 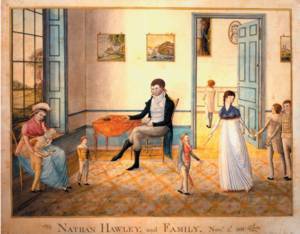 The designs painted onto American floorcloths are directly related to those applied to painted floors in the 18th and 19th Centuries, not those decorating walls. "The designs on the walls and floors were almost never transposed," explained Polly Forcier, who for 30 years has researched and documented historical New England stencil patterns. "Generally, you wouldn�t find a pineapple pattern on a floorcloth, and you wouldn�t find a Moses Eaton pattern there, either. About the only exception I�ve seen is a wreath pattern, which I�ve found on both walls and floors." Home decorating began, in fact, beneath the feet. "Floors predated walls as the first surface in a house to be decorated," noted Forcier. "Over the span of 100 years, beginning about 1740, this fashion�which began in only the most affluent of seaport mansions and inns�spread into the surrounding rural homes." The first floorcloths lacked elaborate patterns or decoration. "The earliest ones were solid green," Forcier said. Thomas Jefferson had a green floorcloth in the main entrance hall at Monticello, according to the home�s inventory of goods. The floorcloth was reputedly painted the color of grass because Jefferson wanted to feel he was still outside when he entered the hall. "The early floorcloth patterns were very simple�like a black-and-white checkered pattern�sometimes with a simple design, perhaps an urn, painted in the center of the floorcloth," Forcier said. "Then you find more complicated geometrics, such as diamonds within diamonds, and eventually you find floorcloths with floral and other hand-painted designs." Embellishments also were common on floorcloths. "For example, many floorcloths were marbleized, where the artist would use the strongest wing feather of a turkey, dip it in paint, and draw it across the surface to create a marble effect that was very popular," Forcier said. Accurately reproducing period style with floorcloths demands modern reproductions. Few (if any) antique floorcloths are available, and they would last only briefly on your floor. Historic homes and museums all use reproductions. You could make your own. There�s nothing inherently difficult about painting canvas, but making an attractive floorcloth takes skill, practice, and the eye of an artist. Even to the casual observer, the difference between a lay effort and that of a skilled professional�in design, durability, and quality�can be breathtaking. That�s why some larger floorcloths fetch thousands of dollars. Three floorcloth artists have been consistently chosen by museum curators and other professionals for inclusion in the Directory of Traditional American Crafts�, although subtle and significant differences mark the work of each. Lisa Curry Mair of Perkinsville, Vermont, paints both historical floorcloths and more contemporary designs. Susan Mugford of East Montpelier, Vermont, specializes in floorcloths based on 18th-and 19th-Century New England designs. Sharan "Sherry" Mason of Portsmouth, Virginia, focuses more narrowly on the 18th Century and is a dedicated purist. All three started by creating floorcloths for their own period-style homes. Lisa Mair got her start painting a single floorcloth a dozen years ago to cover some water-stained floorboards in her kitchen. Now she runs a floorcloth business and has authored one of the leading "how-to" books on the subject. "After I made that first floorcloth in 1993, several friends asked me to make floorcloths for their homes as well," she recalled. "Within a year I�d created Canvasworks Floorcloths, was selling at local shows, and had created a clientele for custom projects." Today Mair works in a studio in a 1790s farmhouse at the foot of Mount Ascutney in eastern Vermont. Her varied background, which includes a degree in mathematics and extensive artistic experience as a book illustrator, is key to her success as a floorcloth artist. "I�m drawn to geometric designs, but geometry doesn�t mean it�s all straight lines and squares," she said. "A simple folk-art motif such a leaf or flower can be repeated to make a wonderful new design�magical patterns evolve, like a kaleidoscope. And I love working with historic colors. Muted, deep reds, browns, and golds show up most frequently in my work." While Mair offers a selection of historical floorcloths, she also has branched out into contemporary patterns. "The designs I�ve painted on floorcloths range from whimsical frogs wearing hats to historical reproductions and everything in between," she said. When asked what makes her floorcloths most distinctive, she talked about hems and preparation. "From my first floorcloth, I�ve always sewn the hem," she said. "As my floorcloths evolved and incorporated the use of very heavyweight canvas, this has meant purchasing a sail-making sewing machine with a powerful motor. The corners have a sewn, mitered finish, so no little tufts of canvas can poke through." Mair puts considerable emphasis on quality and durability. "I take great measures to prevent warping, buckling, and creasing," she explained. "Each canvas is shrunk and primed prior to hemming, which guarantees a flat, even surface with no edges to turn up and be tripped over. I also go to great lengths to produce floorcloths with a lot of depth and texture. I apply techniques such as glazing, sponging, marbling and hand-painted strokes to give each one an aged feel." Her floorcloths cover a wide range of sizes, patterns, and color schemes (including custom designs) with prices from $16 to $35 a square foot, depending on the design and whether the floorcloth is custom. She also sells hemmed and primed blank floorcloths for people who want to create their own. Her book, Floorcloth Magic: How to Paint Canvas Rugs for Decorative Home Use, is a step-by-step guide to preparing, painting, and finishing a floorcloth, which "will inspire amateur and experienced painters alike," according to Library Journal. Another Vermonter, Susan Mugford concentrates on the authentic styles and patterns of early New England. "My love of early American decorating first got me interested in floorcloths," Mugford recalled. "We�d built a reproduction colonial home and I wanted the interior to reflect that period. I�d been doing historic wall stenciling for years and had developed an interest in floorcloths, which would be historically correct for our floors, and practical as well. I researched their history, and about ten years ago started crafting them for my own home." Practice made perfect, and soon Mugford mastered the process for creating durable and beautiful floorcloths that reflected her target vintage. Others were attracted to her creations, and she was able to launch her business, Historic Floorcloths. "My specialty is the floorcloths of 18th- and 19th-Century New England�though I have a few patterns from New York State�where I use the original designs and colors from floorcloths that were found in homes, taverns, inns, and museums," she said. "My favorite is to create a large floorcloth using the exact designs and colors as the original." Her inspiration comes from Shelburne Museum�s Stencil House�an 1804 farmhouse transplanted to the Vermont museum to display its stencil collection�as well as designs from the historic Wayside Inn in Sudbury, Massachusetts, and the Humphries House in Dorchester, Massachusetts, and other historic sites. "I love the history of the floorcloth and how it can bring a historical feel to a room," she said. Mugford uses heavy canvas for durability. She folds over her edges, miters the corners, and uses fabric glue and a rolling pin to create a long-lasting hem. She paints with acrylics but limits her palette to historically authentic colors. She finishes each floorcloth with several coats of water-based polyurethane to preserve and protect the painted surface. Her prices range from $89 for a small floorcloth to around $2,000 for a larger one. "Because of the period I specialize in, many of my designs involve diamonds and squares, with a border around the edges," she explained. "There are some historical patterns I use that also involve floral designs and even some birds." Mugford will work directly with customers in creating floorcloths to meet their specific needs. "I�ll send out an actual design sample so they can chose their designs and colors," she said, noting that both the design and colors still reflect early New England styles. "This seems to work very well and, that way, there are no surprises." "Sherry" Mason is about the closest you�ll find to the floorcloth artists of old. For more than 30 years, she�s been following the 18th-Century methods of creating them. Trained as a classical violinist, Mason�s interests in the decorative arts�especially the Indonesian techniques of hot-wax batik�put her on a different course. "In the 1970s my husband and I were restoring an old house and I was looking for a complementary floor covering," she recalled. "An article in Early American Life prompted me to do further research and then learn how to replicate as closely as possible an 18th-Century-style painted-canvas floorcloth. I found few people were creating floorcloths in the 18th-Century manner then, and that�s still the case now." Like her Vermont peers, Mason learned the craft by producing floorcloths for her home and soon found herself taking orders from friends and family. In 1981 she founded the Olde Virginea Floorcloth & Trading Company in Portsmouth, Virginia, and soon was showing in galleries and showrooms in Williamsburg, Atlanta, and other locales. She has been listed in the Directory of Traditional American Crafts� for 18 consecutive years, for both her floorcloths and folk sculptures. "My focus is the traditional style," Mason said. "There aren�t many floorcloths from the 18th-Century in existence, so I rely on old paintings, estate inventories, custom orders sent to London�especially those from Virginia�and books such as the one engraved and published by John Carwitham of London in 1739, where he illustrates various kinds of floorcloth and tile decorations." The fabrics, paints, and finishes she uses strive for the same authenticity. "My canvas is specially woven for me," she said. "It�s 100 percent natural fiber and extremely heavy, just as in the 18th Century." Unlike many other contemporary floorcloth makers, Mason neither hems nor turns under the edges of her canvas. "They�re cut and flat on the edge, just as you would have found in the higher quality floorcloths of colonial times." Her paint choice also distinguishes her work. "Since my intent is to replicate the 18th-Century floor coverings as closely as possible, I use oil paints," she said. "There are many coats of oil paint applied and, when the design is finished, several coats of a floor varnish to protect the surface. The varnish is a �long-oil� varnish we create, based on an old recipe." Most of her floorcloths cost $20 to $26 per square foot, depending on the design, and custom designs can go higher. Click here for the addresses of the above artists and other source material. This story was abridged from the April 2006 issue of Early American Life magazine. Copyright � 2006 Firelands Media Group LLC. All rights reserved. Click here to buy a copy of Early American Life April 2006. Oregon writer Greg LeFever is a contributing editor to Early American Life.